You can consider adapting a pre-existing structure when designing an ice shack. The best way to begin designing your ice shack is to consider your priorities. Above all else, you may want your ice shack to be easy to transport, or you may not be as concerned with portability, instead preferring to concentrate on making the most comfortable accommodations possible. You can even express your creativity or sense of humor with your shack – the fish will not mind. However, elaborate shanties are not cheap, so you may be keen to build yours within a budget. Achieve portability by designing your ice shack so that it can be quickly disassembled, or design it to be pulled by a snowmobile or all-terrain vehicle. Use threaded bolts rather than screws, to make it easy to disassemble a framed shanty, and ensure that the individual components -- walls, roof and floor -- are small enough to stow in your vehicle. If you intend to drag your shanty into place, build it on a sled- or ski-based platform and attach a strong anchor point to attach a tow rope to your vehicle. Ice tents are another option, and they represent the pinnacle of portability. You can make your own by building a frame from PVC pipe and sewing a canvas shell to fit around the frame. Cut long sections of pipe in half and use straight-line couplers to reattach them, which will make the tent easier to transport. The sky is the limit when building a luxurious ice shack, as suitable funding will alleviate most challenges. Without budgetary constraints, you can make your ice shack rather large, which is not only more comfortable, but it allows you enough room to store gear and handle large fish. Insulated walls and wood-burning stoves can help quell the winter chill, while the addition of cushioned chairs will help keep your legs and back from getting fatigued. You can even provide electricity to run a television, laptop or microwave by adding a generator to your shack. As long as your shack design is safe, keeps you warm and complies with local laws, you can construct the building in almost any shape imaginable. 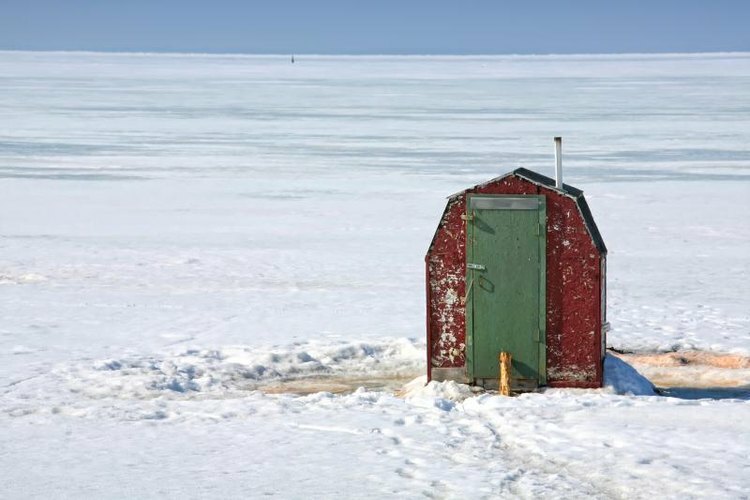 Some anglers have created humorous ice shanties by designing and painting their shacks to resemble whales, castles, polar bears, igloos, bars, bathrooms or police stations. While most traditional ice houses have rectangular footprints, there is no reason why you cannot build a round or oval-shaped fish shack. By incorporating a flexible shell, such as one made from canvas or vinyl, you can use a metal stock tank as the base of your shack. Simply add vertical supports to the tank, to which you can attach a flexible shell. Building an ice shack on a budget usually means sacrificing warmth, as you reduce the budget for materials. However, by reducing the size of your ice shanty, you can reduce your materials budget and make the shack more economical to heat. Reducing the size of your shack is especially helpful for anglers that rely on their own body heat to warm the shanty. Alternatively, if you are trying to save every last nickel, you can use a lightweight, inexpensive vinyl cover, wrapped around a PVC frame as an ice shack, and resign yourself to dressing in the heaviest layers possible.